NOTE: You must be logged in as an administrator to be able to do this option. 2. In the left pane, click on to expand User Configuration, Administrative Templates, Windows Components, and Attachment Manager. 3. 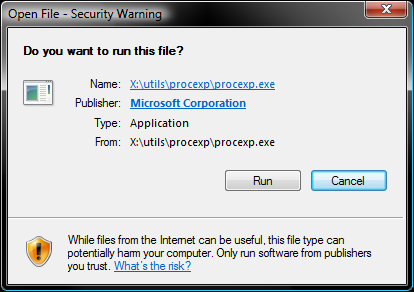 To Enable the "Open File Security Warning"
A) In the right pane, double click on Do not preserve zone information in file attachments. Select (dot) either Not Configured or Disabled, and click on OK.
C) In the right pane, double click on Inclusion list for low file types. D) Select (dot) either Not Configured or Disabled, and click on OK.
4. To Disable the "Open File Security Warning"
Select (dot) Enabled, and click on OK.
D) Select (dot) Enabled, then copy and paste the extensions below exactly as is into the Options box and click onOK. NOTE: These are the most common file extensions for this. If you like, you could add or remove file extensions to or from the list at anytime for those that you want to or do not want to get a Open File - Security Warning for. 5. Close the Local Group Policy Editor window.